I had a feeling that something wasn't just quite right with the laptop. Had it from new for about 3 years, but I noticed that the fan was constantly trying to spin up to max and the general 'feel' in Windows was that things weren't quite as responsive as they should be. I downloaded and fired up Intel Extreme Tuning Utility and noticed that under load, there were regular periods of thermal throttling. I recorded the 5-minute CPU stress test output below. You can see when the blue CPU line goes 100% is when the test started and only a few seconds later, the thermal throttling kicks in. CPU Package temperature is already around the ~85'C. I had heard that there had been issues with the quality of the thermal compound used in production, so I decided I would clean off the old and apply some new. It was straight forward to do, undo the screws on the bottom of the laptop, undo the fan connector, then undo the 4 spring loaded CPU heat sink screws. The whole heat pipe assembly and fan can now be removed. Cleaned off the old thermal compound from the CPU die and off the heat pipe plate, and applied a thin layer of Thermal Grizzly Hydronaught. Re-assembled the laptop, making sure to reconnect the fan! Off to a good start, the laptop powers back on, it was maybe my imagination, but Windows appeared to load quicker. Starting up Intel Extreme Tuning Utility again, and setting up another 5 minute CPU stress test, the output recorded below. What can we see? Well, from the moment the test starts, there was no thermal throttling, and it never kicked in once during the test. The temperature also took a lot longer to rise, and never exceeded 80'c, only briefly touching 80'c towards the end of the test. Overall, I think the re-application of new thermal compound was a success! OpenVPN Dropouts, what's going on? For quite a few days I had been noticing some really odd behaviour on my laptop. The OpenVPN connection would drop and not recover, and the OpenVPN GUI taskbar would show yellow instead of the normal Green connected state. There were no errors showing up on the log and there were no messages to say the connection had dropped. I even resorted to checking the Windows event logger to see if anything was showing up there. Absolutely nothing at all. The underlying WiFi connection would never drop out, and would also show that it was connected. If you tried to navigate to a website, it would show no internet, if I clicked 'Disconnect' on the VPN UI, then it would then allow navigation to a website. If I clicked the 'reconnect' button on the UI, it would usually re-connect just fine. Very occasionally however, it would show a "Waiting for TAP/Tun to become available" message or something like that. Given the various states shown and actions possible I initially thought there was possibly a problem with the underlying Windows TAP driver, possibly a driver corruption. Before I started messing about with any of the software, I did the usual, rebooting and also the enable/disable of the devices and drivers. I re-downloaded the latest version of the TAP driver and the VPN Software from https://openvpn.net/ website. First I re-installed the VPN software, as it included the TAP driver. However, that made no difference. Then I re-installed the TAP driver, but again not a jot of difference. By now, I am thinking things are odd and now into wondering if I had a hardware fault with the laptop wifi card. I fired up my copy of Homedale (can't remember where I got it from, you'll have to search Google), and noticed that the 5GHz wifi band on one of the APs was dropping in and out frequently, despite having quite a good signal strength, and wondered if that was why the VPN layer was dying, but the underlying hardware connection was showing ok, as it was recovering fine from the intermittent drop outs. You can see on the channel and frequency view, the drop out occurring on the 5GHz, but all steady on the 2.4GHz for the same AP. Switching to the signal graph, you can clearly see the 5GHz dropping. Now, having seen this on the graph, that might also explain why I see my tablet periodically drop out as well and then immediately recover. So suspect it might be more an AP problem, than my own hardware. 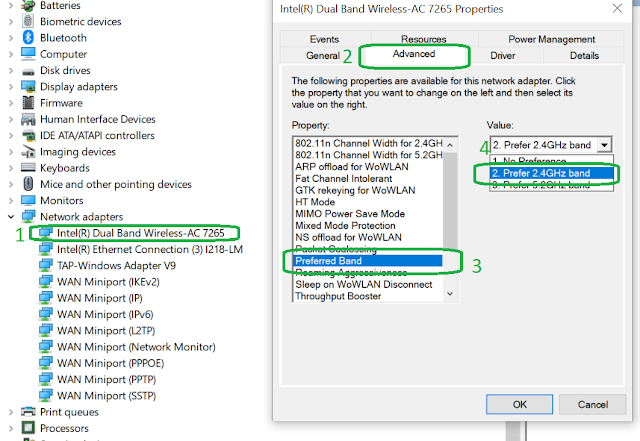 I dropped into the device settings for the laptop wifi adapter and forced the preferred band from Auto to 2.4GHz. Having done this, I have had no issues since! Will have to look at my tablet and see if I can force 2.4 on there and rule out the laptop as being the issue. That will do for the time being......maybe save prodding at the AP for another day. 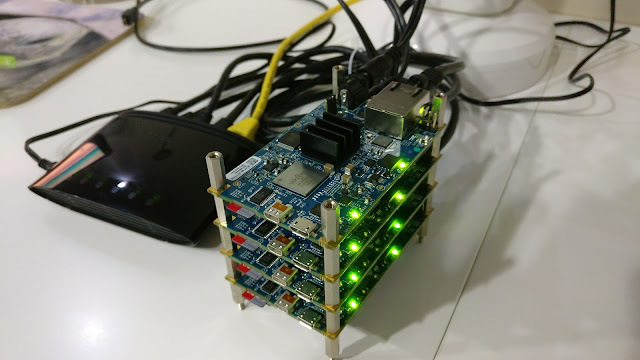 Way back in 2012 I backed the Adapteva Parallella Kickstarter. I was going through a phase of gadgets, and was experimenting will all sorts of electronic boards. Unfortunately, as work and family evolved, I sort of ran out of time and the kickstarter acquired cluster never made it out of its box other than to look at it. Roll on to 2017, and despite having made it from Aberdeen to Qatar, where it stayed boxed for over 2 years, then it was time to move on again. This time it made it all the way from Qatar to Cyprus. One day I was sat in the villa, and for whatever reason I had the urge to at least open the box and power it up. bag of standoffs for stacking the cards. That equates to 16 Epiphany cores and 2 ARM cores per card or 72 cores in total. I downloaded the latest version of both the headless and HDMI images, and wrote the headless one to the supplied SD cards. I didn't have a spare keyboard and mouse to attach to the micro-usb port on each card, so went with the headless image to start with. Assembling the kit, sticking on the heatsinks and hooking the network switch to my main wifi router, inserted the SD cards and powered up the Parallella cards one by one. Looking up the router connected devices to find the assigned address, then creating a static address allocation so it doesn't change in the future. One thing I need to get in the future is a small fan as this is recommended by Adapteva. So, at least it is working, now just need to find something to do with it! More info on both the company and the product can be found at the links below. Have you got one? What have you done with it? Any ideas, or general comments, leave them below. I thought I would just share how things have looked over my first month on Genesis. As I said back in this post a couple of weeks back, I had decided to take Genesis Mining for a spin. I purchased a 50MH/s Ethereum 2-Year fixed price contract for $1450 USD, unfortunately, I forgot to enter a promo code so missed out on 3% discount, and then a couple of days later I decided to add another 50 MH/s (for $1406) for a total of 100 MH/s. Over the course of the first month, there was obviously a sharp rise in cryptocurrency interest and the price of Ethereum started to go up, and subsequently so did the block difficulty. As a result of this, the daily payouts have steadily declined. They peaked at 0.06232985 and a low of 0.03504011, and no doubt will continue to drop if the block difficulty continues to rise. 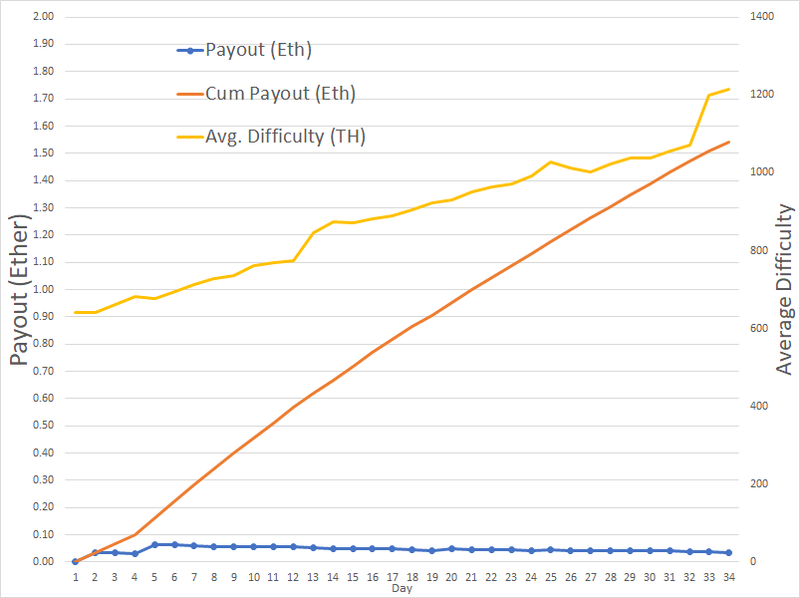 In total, from starting the contract on 8th June, doubling the hash rate on 10th June, through to the most recent payment yesterday, I have received 1.54272847 ETH. It is important to note that the value of Ether has dropped steadily over the last couple of weeks from its peak of almost $400, to current price of $202. There is still a bit of instability, so this may drop further, but could just as easily start to rise again. For me however, I have no intention of cashing out, and planning to sit on this. In fact I have also bought into with cash BTC, ETH and LTC during what appears to be low point or hopefully near bottom. I am planning on sitting on this for a few years, and a lot can happen in a few years. There are various analyst estimates out there on long term numbers, the most recent I have seen is 1000 USD for Ether by year end 2018. I don't think that anyone can really predict what the price will be. And with technology being such a fickle beast, there is no telling where competition or legislation could come from and further influence prices. With the Ethereum contracts being a fixed price, 2 year, no fees, these will now just churn away until they decide that it is no longer profitable to mine, or Proof of Stake is enabled by the Ethereum Foundation, at which point they will switch to another currency. I have no idea if this is a good investment or not, only time will tell.......one thing is for sure, need to hold and hope for a price rise on Eth. If you do decide you want to go and try then save yourself a little bit of money on the price of the contract, don't forget you can use my referral UFain1, or search the net for one of a million other codes out there. In an earlier post, I mentioned that I had been mining Dogecoin back in 2014. In total I had accumulated 139,780.49113397 Dogecoin over the course of just under 3 months. With the rise in value of the coin, I wasn't going to let that go to waste and had the intention of exchanging it for other coin that looked like it potentially for higher growth. Prior to packing my PC into the shipment for the move, I had tried to get the blockchain up to date, but that was taking an eternity as it was over 3 years out of date. I gave up and packed up the PC anyway. On my laptop, I used a back up of the wallet file and then tried to re-sync the blockchain, however again, this was painfully slow. All the transactions were visible in the wallet, but were listed as 'Conflicted' and the balance did not show. This is because the blockchain was not yet in sync. It was at this point I though it must be possible to download a blockchain snapshot to at least get it up to date quicker. And of course, it was time to search Google. Simply searching for Dogecoin Blockchain File, provide a result taking me to https://bootstrap.chain.so/ which also had instructions on what to do. Leaving the download overnight, as it said it was 7.5GB, in reality it was 13GB the next morning I copied the file into the correct Dogecoin folder, opened up the wallet app and left it to do its thing. You can see in the image below [A] the progress in the main window, and in the debug window, where it clearing states importing from disk, in [B] you can see the transactions which are now confirmed as they have synced with the blockchain, and in [C] the transactions still listed as 'Conflicted' as the sync hasn't reached those transactions yet. After about 4 hours of doing the block import from the bootstrap file, I noticed it then switched to Network Sync with over 1.5 years still to sync. The bootstrap cannot have been updated for a while. Still probably gave me a good head start, just no telling how long the remainder will take! Switching to the network view of the debug window, you can see how much data has been download. The graph below is set for a 30 minute window, and after approx 15 minutes it has downloaded 1GB. Unfortunately, after about an hour, the network performance dropped significantly, with frequent drop outs. This really slowed things down. This wasn't an issue with the Dogecoin network, but local internet. The IPTV services we were watching at the same time were also affected. So after about 9 hours after the network sync started and another ~11GB download it is complete! Once the blockchain had fully sync'd, I could then simply send the coin to the exchange where I could convert them to another currency or cash out if I wanted it. The reality is though, I was going to put this to use and convert the coin to Ripple (XRP). Ripple is a "Global Settlement Network" and the underlying coin is used as the transaction payment mechanism. It is currently the 3rd largest cryptocurrency with a market cap of just over $11 billion. I decided I was going to give Changelly a try, and this was a case of setting up a transaction for the amount of Dogecoin I wanted to convert, which coin I wanted to convert to, and of course the destination wallet address for the received coin. It was simply a case of sending the amount to specified Changelly address. Just remember to factor in any transaction fees on the originating network, as I forgot about that the first transaction I set up, and the amount I would have sent would not have matched the amount Changelly was expecting. I guess that first transaction will just timeout when it never sees the transaction amount come in. Anyway, the second transaction was sent, received and verified by Changelly, converted to XRP and deposited in the destination wallet. The whole process only too a few minutes. It is when you can how quick things like this can happen that you see how poor current financial and trading platforms are. Could you imagine how long it would take to sell some shares, wait for it to clear, then buy some other shares. You would be talking days. With regard to Dogecoin, there is now a new client wallet available which does not need the full blockchain to be downloaded onto your PC, so I could always move the coin to a new address and use the new light wallet. I did try and recover the wallet files between the two, but these were not compatible, so was forced to go down the full re-sync route. Remember: Always keep copies of the wallet files on another medium/location and never work with the original, just in case something deletes or corrupts them. If you were to be starting new with Dogecoin, unless you wanted to do mining etc. there would be no need to use a full client, and the light wallet would be sufficient. You could of course simply use an online hot wallet if you were not storing any large volume/value. I guess keeping track of all the wallets and addresses is probably the hardest thing. As more multicurrency 'wallets' become mainstream, things should get easier. Following on from my last blog entry, Blockchain re-awakening.......and of course the crypto-currencies, in this blog, we will look at the various exchanges, wallets and mining options I considered. These are no different to the stock market or currency exchanges at the airport. You can simply hand over a lump of cash and get it exchanged for crypto currency. Likewise, you can also sell your crypto and convert back into cash. Note: Tax laws may be applicable in your location, so you need to be aware of any implications. In the end, the one I have started off with is Coinbase, as it appears to have a pretty good reputation, although they have had some load capacity issues lately due to the sudden spike in interest in the whole arena. A lot of exchanges have also suffered, which doesn't come as a surprise. Depending where the exchanges are located they required different levels of validation of who you are. This is obviously upsetting a lot of privacy advocates, about how it is removing the anonymity within a decentralised system. However, from a fraud and crime prevention point of view you can see why they are doing this and it is probably helping to keep the legislators off their backs. along with the different levels of validation, comes different levels of account limits. i.e. if you have been validated with government documents, e.g. a passport, you can have higher purchasing limits. The exchanges also act as a 'hot wallet' for storing your crypto currency, whether you wish to hold your currency with the exchange or move it out to another wallet is up to yourselves, but you have to factor in transaction costs etc. Purchasing was as simple as entering a payment method, selecting the crypto you want and how much you want and this is then deposited in your account once the transaction has been verified through the blockchain. More on this later. Wallets are essentially public key cryptography stores that hold the necessary key to validate and claim ownership of any coin on the blockchain. Holding references to addresses, transactions, keys, so it is pretty important you look after them. Just like if you lost your wallet in the street containing real cash, if you lost access to your crypto wallet, or someone else found the keys, you could lose all your funds. Hot wallets, are typically online, at an exchange or other wallet provider. You can also have Cold Wallets, Vaults, Desktop, Mobile, Hardware wallets and Paper wallets. In the end, security is what ultimately matters, and many recommend you only keep a minimum about of currency in a Hot Wallet, i.e. enough for your day to day transactions. Each type of wallet comes with its pro's and con's, and again, it is worth investigating your wallets. There is a big push towards Hardware Wallets, like the LedgerNano S, see https://www.ledgerwallet.com/, but as demand is high, these are hard to get hold off without having to wait a couple of months for the next production run or pay some serious markup online. Other than just keeping currency in Coinbase, I have also used Jaxx, which is a multi-platform wallet that you can syncronise across a number of devices. There has been some noise lately that these are vulnerable and not secure. The reality is, that someone has to gain physical access to your device to gain access to your wallet, to then compromise the seed. So providing you maintain a high level of security across your computers/mobiles with strong passwords and pins where appropriate. as you should anyway, then the risk is minimal. Think of it like your ATM card, you need a pin to spend on that don't you? Different wallet providers also support different crypto currencies, whether it is Bitcoin, Ether, Litecoin, Monero, ZCash, and all the others. Send or receiving currency is as simple as entering an amount and entering the relevant wallet address. The wallet addresses are long strings of characters, so it is always recommended to copy and paste the address or scan the barcode to minimise the risk of a mistake and your currency heading of to a complete stranger. You can effectively say you have lost the currency if you send it to the wrong address! Mining is the process of validating transactions on the blockchain. Transactions are bundled into a block and distributed through the peer-to-peer network. The mining equipment then processes the blocks to validate them. Miners are rewarded with new coins for their effort in maintaining the network. The process of mining is computationally intensive and can cost a lot of money. Particularly if you live in an area where electricity costs are high. Individuals can participate in Mining Pools, where they work together and share the rewards. Over time the reward for mining decreases and the difficulty level increases and depending on which coin is being mined, a limited number of coins will ever be generated. GPUs are currently in high demand for building mining rigs, and this has resulted in many online retailers being completely sold out of them. Individuals are selling their GPUs for elevated prices on the likes of Ebay, or are selling pre-built mining rigs for thousands of dollars. There is also a whole industry now set up associated with mining. You do not have to go to the hassle of buying, building and maintaining a mining rig, or dealing with the associated electricity bills. You can in fact buy mining contracts. These again need some research as there is also a lot of misinformation out on the net. With me in the current process of moving house/moving country, my computing rig is currently boxed up and sitting in a warehouse waiting for shipment overseas, so I cannot mine myself at the moment. If you remember from my previous blog, I had mined Dogecoin back in 2014, and recently upgraded the PC to GTX1080ti GPUs for the purpose of video editing, but this could easily be used to generate coin as a mining rig. Depending on what the electricity costs are at the destination, and how computationally 'difficult' the various coins are to mine, then I may set it up to do this again. Not sure what coin though. There are calculators to work out returns, for example see this https://www.coinwarz.com/calculators. As an alternative, I decided I would take a cloud miner for a spin. These are companies that sell you mining power for a price. I have heard many times, "why don't they just mine for profit themselves, it must be a scam", well, nobody knows what the price will do, or how quickly the difficulty rating of the mining increase or other factors such as geopolitical will influence the outcome. Would you spend millions of dollars building a mining farm and then take all the risk yourself? I came across Genesis Mining in my search, and they had Ethereum contracts available. There other contracts for Bitcoin, Monero, ZCash were all sold out. When you do the math, there 2 year fixed price contract at current coin market value and difficult level of mining gave approx 2.5 month ROI, leaving the other 21.5 months to generate value. Of course, once again RISK plays a big part. If there is a collapse in the value of the currency, or the difficulty rating dramatically increases, you returns may be less or lower than your investment. If the price of the coin increases sharply in value, then ROI will be quicker and rewards may be higher. 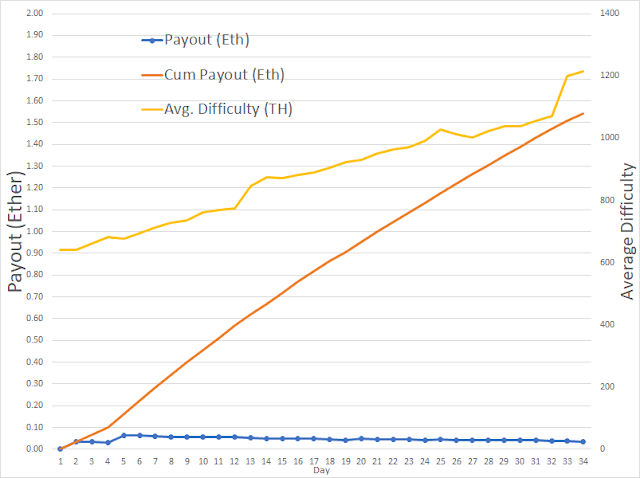 I invested in a 100MH 2 Year contract (actually initially took a 50, then increased this too 100 a few days later), and currently see around 0.06 Eth generated daily, this does fluctuate. So put this against current market price of Ether and that isn't too shabby a daily return. The blockchain is the ledger of all transactions for that particular coin, you can see this information using sites such as https://etherscan.io/ you can see what is going on. This one is for Ethereum, and there are others for the other crypto currencies. Another tool for Ethereum is https://ethstats.net/ this gives you and overview/snapshot on the status of the network. As I have said before, do your research, calculate what risk you willing to take and always don't invest what you cannot afford to lose. There are several cloud miners, wallet providers, exchanges out there and it is a 'minefield', so read, read and read some more to make your own informed decisions. When I get my PC back from shipment, I'll maybe popup a blog on mining with it, or offline wallets or something like that! If you have stumbled across this post, it is probably because you have been searching for something to do with blockchain or crypto-currency or more than likely, if you are new to it all, it will be Bitcoin that you would have heard most of all. I remember when Bitcoin made its appearance or at least I noticed it in 2009, and spent a little bit of time looking at it, understanding what was going on underneath, then got bored and moved on. Getting bored and moving on is probably something I should have not done. A few years later, 2014, I started looking again, and spent a few months mining Dogecoin. Dogecoin was release in late 2013 as a 'joke' currency, and over the course of the time I actually had my PC mining it, I generated around 100,000 Dogecoin. I remember at the time, the currency was 'valued' at about 25 USD. Over the next year the price of Bitcoin slowly fluctuated, but around the summer of 2015 it was hovering around the 250USD level. In 2016, things started to heat up again, and Bitcoin was starting to steadily rise, and by the end of 2016 it was knocking on the door of 1000USD again. I started looking and reading again, and the price was now around 1300USD and I this time, I must get into the market. In something, and this is when I started reading about Ethereum, Another blockchain technology that had the ability to run 'smart contracts' on a de-centralised peer-to-peer global distributed 'computer'. This was a technology that has the ability to radically change everything, and even the major banks, investment houses, technology companies are all really now wakening up to what is going on. I started to look at different exchanges, different wallet, and eventually settled on a couple just to get a feel for them and dip my toe with a couple of low key purchases. This is where I hit my first snag......2FA, or 2 Factor Authentication. Having registered for the exchanges, and tried to make a purchase, both the exchange and the credit card clearing houses needed 2FA codes to authenticate and yep they wanted mobile phones which I did not have with me offshore as they are not permitted. So I had to wait until I got back onshore. This was a painful 3 weeks wait, The price of Bitcoin rose and broke through the 2000USD barrier, then continue to rise to a peak of around 2900USD! Ethereum's underlying currency Ether was also doing the same thing, It had gone from 160USD to 400USD in the same time frame. So, this is where there is a major RISK that everyone must recognise. Crypto-currency are notoriously unstable, and can have massive price swings and collapses over the space of hours. This isn't much good if you are shorting for profit, unless you catch up upward swing, like on a bounce. If however you look at what the underlying technology provides, how it works, its implications on society/consumerism and the general financial world then it should be the long term we are interested in. In the last year, Bitcoin has increased by 240%, Ether by 2700% and Litecoin by 670%. Where they are going.....well that is the mystique of it all! There are numerous crypto-currencies now out there, some are already dead, others are starting to grow. Litecoin is one of those slowly growing in value, as individuals start to spread risk across multiple coins. In the last 3 days alone it has increased from 25USD to 40USD, but could just as easily turn to junk. Ethereum platform also allows companies to generate there own 'tokens' (or sub-currencies) that sit on the Ethereum blockchain and have been selling these to raise funds for new company startup financing. There has been a flurry of these lately and are know as ICOs or Initial Coin Offerings. Bancor is probably the most famous of these ICOs so far, as it raised 150,000,000 USD (value at time of offering) in the space of 2 hours. Institutions can also use the technology of Ethereum to create their own private blockchain for internal use. The most important thing however is to research. There is a lot, and I mean a lot of false information, speculation and general noise out there on the net. And if you do decide to invest/purchase/trade then do not play with anything you cannot afford to lose. The volatility is higher than the stock market, and with increased risk can carry increased reward......but take it on the chin if it all goes wrong! Balding Dad, Oil & Gas industry, Offshore, Code Tinkerer, Gadgets. dave auld (c)2015. Awesome Inc. theme. Theme images by RBFried. Powered by Blogger.